After only a year and however-many days, I finally finished this issue on January 27, 2016. I did the first article while getting in almost four miles of walking at the Leon Creek Greenway. I had a few minutes left on the second article when I finished walking, so I listened to it in the car on my way to my next errand. We start this article with a history lesson about the Coast and Geodetic Survey, which was authorized by Thomas Jefferson in 1807. When Jefferson authorized it, it was called “The US Survey of the Coast,” at the time this article was written, it went by the United States Coast and Geodetic Survey, and since 1970 it has been known as the US National Geodetic Survey. This is one of the hazards of writing on articles written over a hundred years ago. We get entirely too much technical information, which is great for the original intended audience, but seems a bit much for the casual reader. I did find interesting, however, that the survey, however named at the time, were put in charge of defining our measurement system. The final data had to be understandable by anyone who read it, so the Survey defined all measurements, not just the ones that they were using, including the pound. The Survey and Map of Massachusetts begins inauspiciously with the text of the law authorizing the survey and pretty much stays in that kind of dry mode until the bitter end. If you want to know how many square miles of Massachusetts were surveyed using the traverse method, this article’s for you. Next up in the gripping world of National Geographic in the 1800s, (possibly I will begin listening to this one on January 30, but I might not, since I have a bit of a sore throat and might be coming down with something), Volume 1, Number 2, from April 1889, which includes National Geographic’s first trip to Africa. I literally did just flip a coin there, and it came up tails, so the cemetery it is. In the 1850s, there were two graveyards in the area near the intersection of Houston and Santa Rosa Streets. On one side of the line which is now Houston Street (underneath where the Children’s Hospital of San Antonio is today) was the Catholic cemetery. On the other side of that line was a public cemetery for non-Catholic burials. After only a few years, the number of dead in the public cemetery became too great for the small plot of land and all of the bodies there, except, to our knowledge, one, were moved to other cemeteries. That one body belonged to Ben Milam. Benjamin Rush (Ben) Milam was born in 1788. 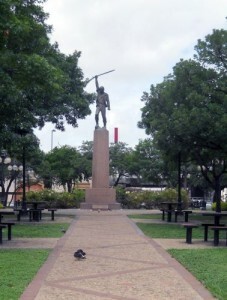 In the early 1800s he moved to Texas and when the war for Texas Independence began, he is claimed to have called for recruits to take the town of San Antonio by calling out “Who will go with old Ben Milam into San Antonio?” In one version of the tale, he is said to have drawn a line in the dirt on the ground with a stick in his hand. This will be important later. Milam was killed during the Siege of San Antonio by a gunshot to the head. He was on his way to the “Veremendi Palace, which the house gained the title “Palace” because it had been home to one of the governors of Coahuila y Tejas. The Veremendi Palace was on Soledad Street not too far from Main Plaza. Milam’s body was buried in the yard of the house originally and later his body was exhumed and moved to the public cemetery. Once his body was interred in the public cemetery, a marble marker was placed over the spot. Later that marker was removed and replaced by a granite monument, which was originally supposed to have been surmounted by a statue. They never put the statue on the monument. 34 years after Milam’s burial, they turned the land into a park and named the park for Milam. In 1938, the Texas Centennial Commission put a statue of Ben Milam holding a rifle aloft in his right hand on the west edge of the park. Over the intervening decades, the knowledge that the granite monument was a gravestone was lost and, in 1976, the marker was moved as part of a park beautification project. In 1993, the city began renovations on the park and the workers found a skeleton under a concrete slab. The slab was near the center of the park and was just little larger than the size of the granite monument. Since the granite monument was heavy and had originally been planned to be even heavier, the archaeologists who were monitoring the project decided that the concrete slab may have been the original foundation for the granite monument. If that were true, the skeleton had a good chance of being Milam’s remains. They exhumed the body and took it to the Center for Archaeological Research at the University of Texas at San Antonio. The remains were of a man of about Milam’s height who was about Milam’s age at death. Only fragments of skull were found, but they had markings consistent with having been killed by a gunshot to the head. Remember the stick in Milam’s hand up there? In that tale, he didn’t pick it up from anywhere, it just sort of was in his hand. The body was found to have belonged to someone with arthritis in his legs and back, and, well, a cane is, in fact, a stick that you hold in your hand. Remember that that land was only a cemetery for a few years. The odds of another body having been placed beneath a concrete slab the size of the grave marker for Milam during those few years are slim. Add to that the fact that the body found was a male the same height as Milam makes the chance that it’s anyone else slimmer. That plot of land was a cemetery decades before the era of the old west gunfight (and San Antonio hasn’t been so much “western United States” as “northern Mexico”). Most of the bodies in the cemetery had died of things like cholera and old age. As a result, the bullet wound to the head makes it nearly certain that the skeleton belongs to Milam. The body was re-interred under the statue in Milam Park in 1994. Milam Park is a nice little (emphasis on “little”) park. From what I can tell, it is around four acres in area and, in addition to Milam’s grave, has a playground, a gazebo, picnic tables, and a quarter of a mile of walking trails. As with most other urban parks, Milam Park looks pretty wheelchair accessible. The park is all level and paved and there are curb cuts. I finally got back to “reading” the October 1888 issue (thank you, LibriVox!) and so I’ve decided that it’s time to move this over here from my old blog. We’ll be moving on to the next three articles in this issue, probably on January 26. This is the only title this piece is given. No author is identified, either. A blurb at the end of this piece says that correspondence should be addressed to “Mr. George Kennan,” so perhaps the announcement was written by Kennan. On the other hand, perhaps not. The announcement is about the formation of the National Geographic Society and their intention to publish a magazine “at irregular intervals.” Interestingly, the announcement says up front that the magazine will publish articles by people from all walks of life who are interested in geography. The National Geographic Society has chosen Washington, DC as the home of the society to further the notion that it is a national organization and not a local one. One thing that I found interesting is the statement that the National Geographic Society membership was, at the time, around 200 “persons,” which seems to me to indicate that the National Geographic Society had female members nearly from its inception. I wonder what George Kennan, or whoever wrote this announcement, would think about the National Geographic Society in the 21st century. The introductory address of Gardiner G. Hubbard, the first President of the National Geographic Society, took up eight pages of this issue. Hubbard begins by saying how pleased he was that the National Geographic Society would elect a non-geographer as its first President. Hubbard was an attorney and businessman (and one of the founders of the Bell Telephone Company). He also was father-in-law to the man who would one day become the second President of the National Geographic Society, Alexander Graham Bell. Hubbard says that he wants the National Geographic Society to continue to include non-geographers and makes reference to using the organization to unite “the scattered workers of our country” with geographic researchers. I am uncertain whether the workers in question are field workers in geography or workers in other fields who are interested, but not professionals, in geography. The address goes on to cover the history of geography in a very European-centric manner, which is about par for the course of the era. He refers, for example, to Columbus as the discoverer of the Americas, totally ignoring the people who were already there. Hubbard mentions some other geographical organizations at work in the world, including the Royal Geographical Society of England and urges the geographers of the United States not to be left behind. Hubbard ends the address with a discussion of the organization of the society, including a department devoted to the “geography of the oceans,” which sounds like oceanography to me, and another that studies the “geography of the air,” which sounds like a combination of meteorology and climatology. Well this was every bit as gripping as I expected it to be. Apparently, in 1888, schools didn’t have geography courses as we know them today. Also, apparently, the intended audience for National Geographic was men (judging by the assumption that the people who attend school are boys). Also, thank heavens for Librvox. I was able to listen to this article as I scanned in photographs from my family’s 1988 vacation to New York City. I made a good 1,000 steps according to my pedometer in the process, as well. The basic premise is that by studying how things look now, we can draw conclusions about what happened in the past. One of the examples that Davis gives (relatively late in the article, to my mind) is that we don’t need to watch the acorn sprout in order to know that that’s where the oak tree came from. We spend a lot of time in New England here, from discussing the age of the Appalachians to talking about lava sheets in the Connecticut Valley. Much of the rest of the article discusses examples from the United States. This may be due to the fact that the publication is named “National Geographic” and not “International Geographic,” but also Davis makes the point that the United States is the first nationt to make a detailed description of the topography of the country. In fact, Davis says “the systematic study of topography is largely American,” due to studies of the topography of the United States done in the period from around 1840 to around 1870. This study was not done by the United States Geological Survey, however, since the USGS was not formed until 1879. Davis goes into how to tell a young landform from an old one and by his argument, the Himalayas are much younger than the Appalachians. And, indeed, that is still the current theory. The Himalayas are likely the youngest and the Appalachians are likely to be the oldest. The article ends with a plea for more geographic instruction in schools and offers the idea that models be used rather than maps. Davis’s first idea was definitely implemented; my son and I both had geography courses our Freshman years of high school. At least in my course, however, we didn’t use so many models. We still relied largely on maps. Morell has decided to take photographs of the National Parks of the Western United States with a camera obscura. I’m not sure exactly how the science works, and I’m sure that if I tried it, it would fail miserably, but apparently somehow, if you make a room completely dark and then poke a hole in the object darkening the room, it somehow turns the light outside into a projector and you can see an upside-down version of the view outside on the wall of the room. I’m sure that if I tried it, I would just get a pinhole of light on the wall. I can make even the simplest things unbearably complicated. But apparently this technique works for Morell. And so Morell, with the help of his assistant, C.J. Heyliger, has designed a completely dark tent with a pinhole in it. Morell takes this tent out to National Parks and uses it to take camera obscura photos of the parks projected on the ground under the tent. The result is photographs of, for example, Old Faithful and the people surrounding it on a background of rocks and twigs. The images that result are beautiful and worth the time to look at. If you don’t have a subscription to National Geographic, some of these photographs (including others taken in cities including Rome, Florence and New York City) are available at Morrell’s website (my one criticism of the site is that the caption shows up for a fraction of a second and I cannot make them show up long enough to read). Building the Ark is about the role of zoos in preserving threatened and endangered species and also about the perception that only the big mammals will bring people, and thus money, to the zoos. This is particularly important since most of the threatened and endangered species in the world are amphibians. Onnie Byers, of the International Union for Conservation of Nature suggests that zoos should gradually phase out species that are not yet in dire need of preservation in favor of ones that need the help more urgently. Kolbert gives us the example of the Kihanzi spray toad of Tanzania (I had the worst time trying to type “Kihanzi” and I’m not entirely sure I have it right yet). The toad was discovered during the construction of a dam. The government of Tanzania realized that the dam project would likely wipe the toad out and so 499 toads were captured. Half were sent to the Bronx Zoo and half to the Toledo Zoo. Soon after the toads were brought into captivity, a fungus wiped out the population in the wild. This meant that the survival of the species depended on less than 500 individuals left in the zoos. Fortunately, the zookeepers were able to induce the frogs to reproduce and in 2010 a hundred were sent to the University of Dar es Salaam in Tanzania. In 2012, some of the toads were released into the wild. Then there is the “frozen zoo.” The San Diego Zoo has a room dedicated to saving the few living cells of species that are about to go, or have just gone, extinct. Those cells are not necessarily reproductive. One example given is the po’ouli, a Hawaiian bird, the last example of which was sent to San Diego after his death. The only cells that the zoo was able to culture were from the bird’s eye, so they were frozen in liquid nitrogen against the day that science could resurrect the bird. We’re back to the one of the themes this issue started with, that everyone has his or her own camera today and thus the nature of photography is changing. Pictures of unfolding events can be shared on the spot, rather than having to wait for a professional to arrive. This one has less of the dismissiveness than I sensed from Draper’s writing and more hope. In particular, Estrin acknowledges that many of the photographs being taken by average citizens are very good and that it is an excellent way to expose things like the abuses of those in power to the light. This will perhaps lead to less of the abuse of the powerless by the powerful. Manipulated photograph of Abraham Lincoln. The body is of John Calhoun. There is one comment that Estrin makes that I have to comment on, however. Estrin says, “Before digital images most people considered photographs to be accurate renderings of reality,” and then goes on to say that with digital image manipulation, now “the average viewer” cannot trust the pictures they see unless it comes from a trusted “news organization or photographer.” I guess that citizen photographers could be considered that kind of photographer, if, for example, they know the photographer personally, or have a friend or acquaintance in common. But photomanipulation goes back before the days of digital computing. 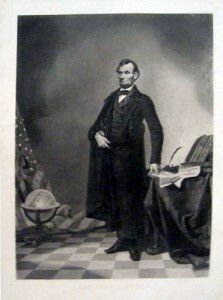 A famous photograph of Lincoln (see image above) is actually a photograph of John Calhoun with Lincoln’s head pasted on. And one of the first manipulated photographs was also a selfie. Hippolyte Bayard felt slighted over not being named one of the inventors of photography by the French government, so he took a picture of himself looking like he’d drowned and then darkened his feet and hands to look like decomposition. Bayard lived another 47 years after his apparent suicide. This article opens up with the assumption that all humans will find people of a mixed-race ancestry somehow unsettling. Even the most benign among us, we are told, will be curious about the mix of ancestry that led to, as Funderberg put it, “those eyes with that hair, that nose above those lips.” I have to admit that I’ve never felt that way. I look at a mixed-race person and see, sometimes, a friend, or a patient, or a coworker, or a stranger (who may eventually become a member of one of those three groups). I also have had the experience of looking at a mixed-race person and seeing Alex’s cousin. After Funderberg shakes off this rather curious opening the rest of the article is about the practicalities of mixed race, particularly when it comes to the United States census. There have, so far, been only two censuses in which respondents were allowed to choose more than one race, and this is the largest category of growth in the intervening ten years. The article ends on a hopeful note that perhaps we can put aside this assumed discomfort and accept that people can fit into more than one box. Sullivan and Guttenfelder were part of a small group of journalists who were allowed to visit North Korea repeatedly over “the past year.” Since there is no indication when this article was actually written, and it was published in an issue dated October 2013, I assume that “the past year” was 2012, more or less. In Now You See It, we see some of the things that Sullivan and Guttenfelder saw during their visits to North Korea, including things that they shouldn’t have seen, such as a potholed street with darkened buildings. We also hear the questions that Sullivan was unable to ask, such as inquiries into whether North Koreans have freedom of religion and whether the couple that they meet who were given a luxury apartment for the wife’s productivity at work actually live in that apartment. I kind of eat up stuff on North Korea. I do, after all, want to go everywhere, and North Korea truly is “somewhere.” And, being an American, I know that even if I am granted entry into the country, my stay will by necessity be a brief one. So, I read what I can, and look at pictures, and try to understand their lives as best I can.